From 28 January 2018, there will be changes to a number of services, mostly to improve reliability. There will also be some new travel opportunities, such as service 9 running to Dalton Park providing a number of new connections. A new Crusader 26 service will be introduced, which gives a service every 10 minutes to Newcastle from Jarrow, and opens up new direct connections to Newcastle from Primrose and South Leam. This service will be extended from Jarrow to North Shields via the Tyne Tunnel, replacing service 9 on this section of route. Service 5 will no longer serve Morrisons in Jarrow. In Jarrow Bus Station, the service will use Stand B towards South Shields and Stand D towards North Shields. There will be minor changes to the timetable of journeys between Jarrow and South Shields. This service will continue to run up to every 20 minutes between Jarrow, The Boldons and Sunderland. The section of route between Jarrow and North Shields will be replaced by service 5. From Jarrow, service 9 will now run to Lukes Lane Estate, via Argyle Street, Lyon Street, Hebburn Town Centre, Hartleyburn Estate and Monkton Lane Estate, replacing this section of services 88/88A. From Sunderland, the service will be extended to Murton via New Seaham and Dalton Park, replacing service 61, and offering new cross-town connections. In Jarrow Bus Station, the service will depart from Stand A towards Sunderland and Stand D towards Lukes Lane. In Park Lane Interchange, the service will depart from Stand F towards Jarrow, and Stand C towards Murton. 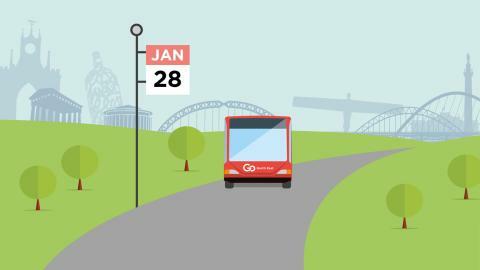 There will be more journeys to Newcastle, with buses between Newcastle and Jarrow now running up to every 10 minutes on Monday-Saturday daytimes, and every 15 minutes on Sunday daytimes. Journeys will continue to run every 30 minutes on evenings. Between Jarrow and South Shields, journeys will run every 20 minutes as service 27 on the current route via Tyne Dock, and every 20 minutes as service 26 via Primrose, South Leam and South Tyneside Hospital, replacing this section of services 88 and 88A. This offers new direct connections to Newcastle from areas such as York Avenue, Primrose and South Leam. In Jarrow Bus Station, services 26 and 27 will use Stand E towards Newcastle. Service 26 towards South Shields will use Stand A, with service 27 towards South Shields using Stand C.
A small number of early morning and early evening journeys are retimed. There will be some changes to the times of some morning, early evening and Saturday journeys. In Houghton-le-Spring, service 36 towards Chester-le-Street will now stop near Lloyds Bank, not Costa. Other stops in Houghton-le-Spring are unchanged. Minor changes to the times of a small number of journeys. This service will be replaced by extended service 9. The route of new service 9 will be the same as the current service 61, with buses running between Sunderland and Murton every 20 minutes on Monday-Saturday daytimes and every 30 minutes on evenings and Sundays. Due to low passenger numbers, the journey which departs Gateshead at 6.08pm on weekdays will no longer run. The route of this service will be revised in Winlaton and there will be some minor changes to times. It will now run a one-way loop, running from Blaydon to Winlaton direct via Blaydon Bank, then returning from Winlaton to Blaydon on the current route via Parkhead Estate. Anyone wishing to travel to Parkhead Estate will be able to stay on board the bus at Winlaton without the need to buy another ticket. Evening and Sunday journeys will continue to run direct on Blaydon Bank in both directions. Between Jarrow and South Shields, service 88 and 88A will be replaced by new Crusader service 26. Between Jarrow and Lukes Lane, service 88 and 88A will be replaced by service 9. New service H1 will provide direct connections between Hebburn and South Tyneside Hospital between approximately 9.30am and 2.30pm. The journey at 3.10pm from Gateshead on weekdays is retimed two minutes earlier. The journey at 5.46pm from Lobley Hill to Gateshead on weekdays will no longer run due to low passenger numbers. The service will now observe all stops, including Swalwell Monument and MetrOasis. This service will now depart from Stand A in Sunderland Park Lane Interchange. There are no other changes to this service. Weekday journeys at 3.02pm and 3.17pm from Stanley are retimed two minutes earlier. Weekday journey at 9.10am from Newcastle is retimed to 9am.